A long time ago Senshi, a Japanese Master Sushi Chef became disillusioned with his life and decided to set sail on a voyage of discovery to reignite his passion for his beloved sushi. This journey would take him to faraway lands and mystical cultures! Sometime into his journey he ran aground off the coast of North Africa where he stumbled across a Mexican Cactus farmer by the name of Miguel. Miguel had lived there for many years and offered to help repair his boat, in return he wanted him to help tend his cactus farm and to teach him how to make sushi. Senshi & Miguel would spend alternate days between working on the boat and tending to Miguel’s farm. At the end of each long day they would return to Miguel’s home and enjoy creating sushi. As time went by the became the best of friends, learning about each other’s lives & cultures. Miguel was intrigued by the practice of sushi but questioned why only raw fish was used. 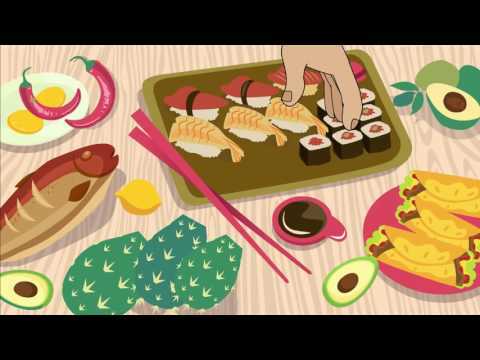 He began making sushi with different types of cooked fillings to see how it would taste. Although he had learnt the art he wasn’t particularly good at it, but Senshi liked the idea of using local Arabic flavours mixed with Mexican spices and worked with Miguel creating many different types of sushi. Several months passed and the boat was finally fixed. Although both friends were happy Senshi could return home, there was sadness as they had become so close to each other. On their final evening Senshi offered to make some special new sushi that he had been thinking about and something he wanted to serve in his restaurant when he returned home. In return for the magical array of sushi Senshi created Miguel gave Senshi a rare and special type of Cactus and said from that day forward he would always refer to his friend as Cactus Senshi to remind him of the bond they shared. The next morning Cactus Senshi set sail for home but vowing to keep his promise and create a range of sushi which embraced the local Arabic flavours, culture and most of all was a tribute to his time with Miguel.